Most businesses are very proactive about recruiting salaried employees, but let their efforts slip when it comes time to find quality hourly employees. Continue to spend time finding salaried employees, but don’t overlook the importance of recruiting when you need hourly staff members too. The best way to land quality hourly employees is by becoming a company people want to work for. If your business has a reputation for being a great place to work, you’ll find that it’s much easier to get great workers, regardless of whether they’re salaried or hourly. Treat your employees well, value their opinions, and respect their time and you’ll find that your organization’s positive reputation quickly spreads. In order to recruit well, you need to make it easy for potential new employees to apply for open positions. This means making applications available in-person and online. If you only take applications dropped off during business hours, you’re closing your office off to a whole pool of people who may not be able to take the time off to come in. You might want to also consider implementing video interviews into your application process. One-way video interviews, in particular, are very convenient for job seekers because they can record their responses to your questions whenever convenient for them. In order to set your business apart from others, add in a human element to the job application process. For example, reply to those who submit an application, even if they aren’t actually offered a position. Just because a person isn’t qualified for a particular position that’s open at that time, doesn’t mean they’ll never be qualified to work for your business. Keep their information on hand and you may be able to call them when something else opens up. This also makes the search process much easier and more efficient. There are some stigmas that exist about hourly positions that can make them less desirable to potential employees. Make it a point to even the playing field and treat salaried and hourly employees the same. While benefits and levels of responsibility may differ, all employees should be treated with respect, and should be made to feel as though they are an important part of your business. 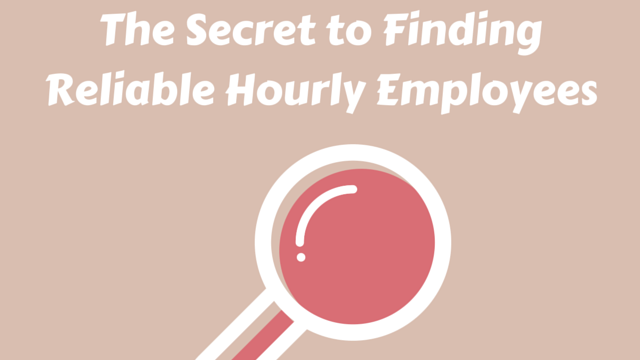 How does your business go about recruiting new hourly employees? Share your strategies with us in the comments!